Did you ever wonder about the so-called Lost World? Perhaps a game or two of Atlantis Slots would excite you. Atlantis slots is a three-reel, single-line, Microgaming slot that is sure to take any boredom away during a visit to the casino. It comes with an Atlantis theme, of course, and uses it as a backdrop, so naturally the symbols that are used during game play would include treasure chests, seashells and seahorses that are shaped like sevens. Thus, it would not be a surprise that among all slot games, the Atlantis slots would stick in your mind because of its unique winning combinations. Atlantis slots are fairly easy to play – and win. 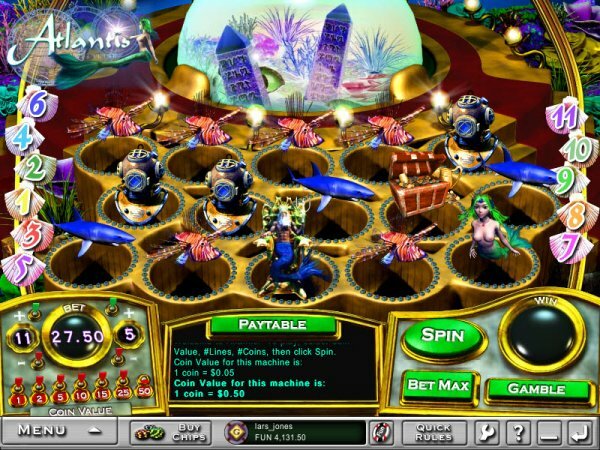 Out of the three reels, you only need one seashell in order to get the minimum payout. It is even possible to double your payout by just getting one treasure chest symbol. Naturally, if you get two treasure chests out of three reels, you would be able to quadruple your payout. The most that you can win from a game in the Atlantis slots would be $1600. Now, you have a slot machine to look forward to during your next visit to the casino.